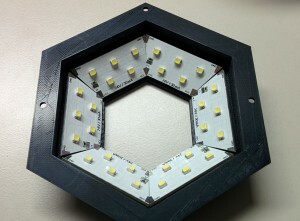 Six individual segment boards are connected by solder joints on the corners. The array nicely fits the 3D printable camera mount I described in another post. I have to give credit to Brian Dorey for the design idea. 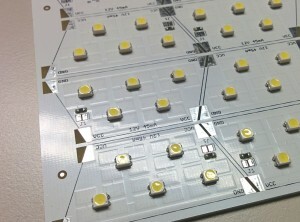 I designed the boards for OSRAM TOPLED in P-LCC-4 package. These are widely available high quality parts with good brightness, available in many colours. 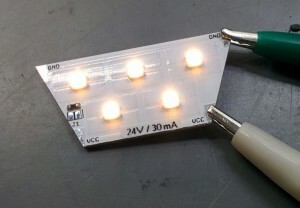 My boards have pads for current limiting resistors (R1) so you can run the array directly from constant voltage supply. If you prefer to use a constant current source, just bridge the solder jumper (J1). Resistor values, voltage and current obviously depend on the LED you choose. I found that red light works great for part detection and other calibrations. Most CMOS cameras are quite sensitive to that wavelength and using one monochromatic colour can help eliminate ambient light effects. In other situations a RGB image is desirable, for example if you use nozzle’s which have a coloured vision shield (e.g. Juki nozzles have green plastic discs) which can be removed using chroma key filters in software to enhance edge detection. 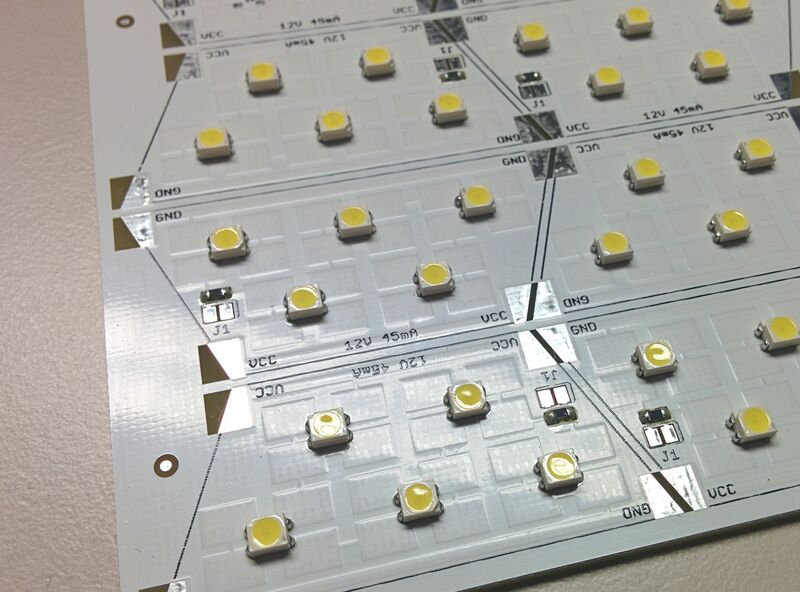 I have tested LS E67B (red) and LW E67C (netural white) LEDs succesfully. I am sharing my design under CC BY-NC-SA 4.0 license. I also have some panels left which I could sell to you; you will need a CNC mill or other PCB cutter to separate the panels as I did not have the boards V-scored. If you do not have the tools or the time to make your own LED lights, I could even populate and reflow solder these parts for you. Please send me an e-mail me at impressum@no-spam.malte-randt.de if your interested.